The National Security Agency’s website went down on Friday and the US spy service known for hacking into computer networks said it was investigating the outage, a spokesperson said. “We are looking into this,” said Vanee Vines of the NSA, without offering any details about what had caused the site to go dark. The website, nsa.gov, went down on Friday afternoon, setting off speculation on Twitter that the site may have suffered a denial of service attack by hackers. The hacker group Anonymous joked about the website going down in a tweet without saying if it had played any role. 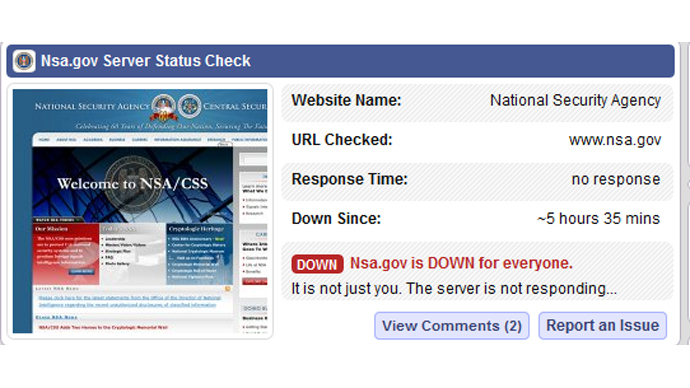 “Aw don’t panic about nsa.gov being down. They have a backup copy of the internet,” it said. The loosely organized, international hacker collective has frequently clashed with US authorities over file-sharing as well as allowing banks to handle donations to the anti-secrecy group WikiLeaks. The NSA has been at the center of a furore over its vast electronic surveillance operations, revealed in a series of leaks from former intelligence contractor Edward Snowden, who has obtained asylum in Russia. October 26, 2013 in Politics, World.